Thank you for your interest. This is my first interview so I will do my best to answer your questions, but there may be questions I may not be able to disclose due to angel secrecy. I hope you understand. Before you met Claudia, what was a typical day like for you? Since we have no concept of time in Halo City, I can’t tell you what my day is like, but I can tell you what I have been doing: teaching the young ones sword fighting; practice sword fighting-mostly with Davin; reading the bible with Alexa Rose and other children; meetings with Phillip, Margaret, and Agnes; and learning the history of before and after Christ. I also enjoy making things out of my hands, but my favorite thing I made was the butterfly necklace I made for Claudia for her birthday. These are just few of the things I’ve been doing. Since spending time on earth, have any of your memories come back? Spending more time on earth has not brought any memories back. I honestly think it will never happen. The Royal Council does not make mistakes. They were adamant about wiping our memories of our lives on earth. But the emotions have not disappeared. The human emotions are much stronger on Earth, for example, such emotion as jealousy. The thought of Claudia with another guy just drives me crazy, not that she was, but the thought makes me angry. Also, when I’m around Claudia, I can’t think straight. We are forbidden to fall in love, but I can’t help the way I feel. When I hold her in my arms, my heart beats faster. I melt into her and my human emotions start to take over. What made you decide to leave Aden? I followed Aden, thinking that it was the right thing to do. We believe that angels and humans can co-exist. I strongly believed in our quest. I decided to leave Aden when I found out his true motives. Not only did he want to take over Crossroads, he wanted to take over humanity and have them worship him. I finally opened my eyes and I encourage many to follow me to stop Aden. Unfortunately, I was deceived by a friend and Aden knew our plan of attack. That day is very hazy. I remember being injured and the next thing I knew, I was laying on a bed in Halo City, recovering. What are some of your special talents that we haven’t seen yet? Claudia called me Superman once. I didn’t know who Superman was, let alone his powers. I asked Davin to find out who Superman is because I wanted to know who Claudia thought so highly off especially if I had to worry about him swooning over her. Now that I know he is a fictional character, I can relax. You can compare my powers to Superman. I have strength. I can fly and see through walls. My wings, soft and comforting, is my secret weapon. Special talents you haven’t seen yet-I am one with nature. I can make it snow, control temperature, levitate things and people and I have yet to discover more. Other than spending time with Claudia, what is your favorite thing to do? Besides spending time with Claudia, I enjoy spending time with Alexa Rose, Davin, Vivian, and Caleb. Also, I enjoy observing human mannerism. For example, I'm trying to understand why Ryan behaved the way he did on his birthday party. He was drunk and acted inappropriately. Why did he behave this way? Did he think he was going to win Claudia back by acting ridiculously? What is something you would like to do on earth that you haven’t had an opportunity for yet? I haven’t had time to see the world. I would love to see the world with Claudia. I can definitely fly us anywhere. I would also like to watch the cool action movies, especially Superman movies. Though I know it is produced by special effects, they look so real. I get a kick out of it. 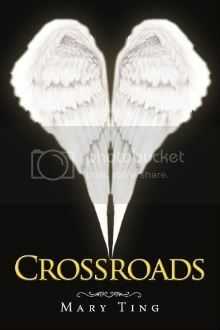 I'm very excited to have one signed copy of Crossroads to give away! To enter, please fill out the form below. This contest is open to US residents only. Must be 13 to enter. You must be a follower of Mary Ting's Facebook page. Please see my Contest Policy for more information. This contest will close on September 30 at 12 midnight CST. I think Michael sounds like a guy I would love to meet *hubba hubba* :) Awesome interview! !